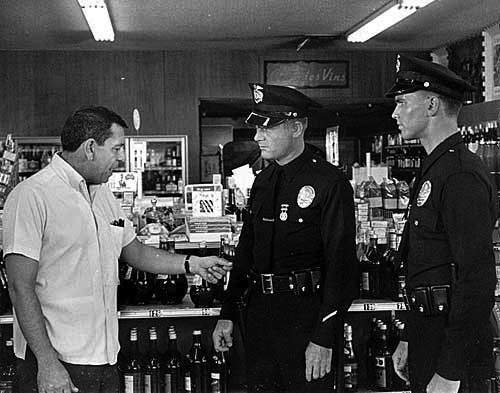 Dialogue Of The Day: Adam-12 (1968). From the first episode of Adam-12, “The Impossible Mission,” which was actually directed by Jack Webb. Felt like we were overdue for some Jack Webb. By the way, the patrol car Malloy’s referring to (and leaning on) is a 1967 Plymouth Belvedere. The Jack Webb Blogathon: Behind The Badge. This post is part of The Jack Webb Blogathon, a celebration of his huge, and hugely influential, body of work. For more Webb on the web, appearing October 17-19, visit Dispatch (or click on the banner below). As The Jack Webb Blogathon comes to a close, here’s some interesting trivia about Jack Webb and his work. In lieu of compensation for assistance and information, what did Jack Webb’s Mark VII Production Company do for the Los Angeles Police Department? The Company made generous contributions to the Los Angeles Police Orphans and Widows Fund. How did Dragnet get the stories as basis for their episodes? Through an arrangement with the Los Angeles Police Department, an officer wrote up a three-page report void of names and intimate details. Dragnet writers filled in the blanks and wrote a story around it. They were not given access to actual police files. Where did the number 714 come from on the famous badge? Jack Webb thought 7 was a lucky number. 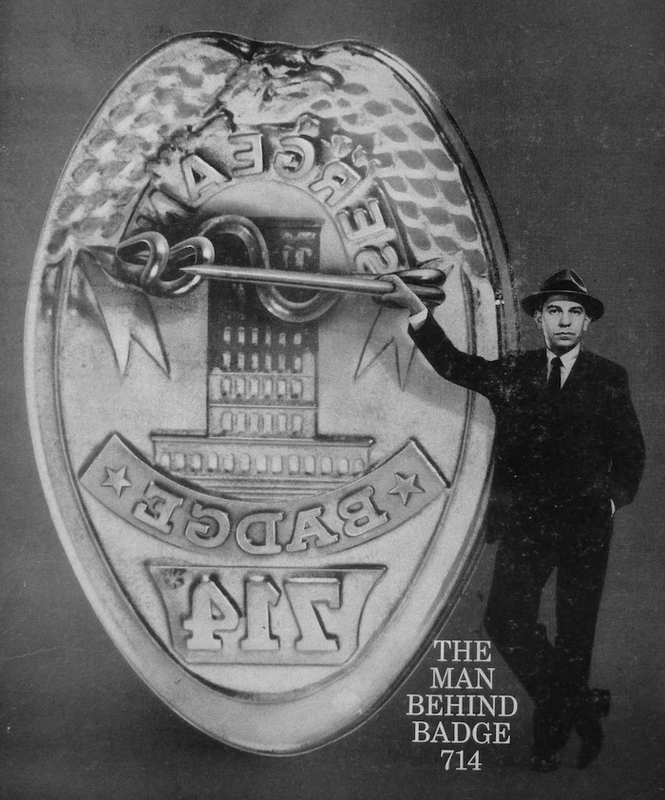 The television series began in 1949 and Webb thought badges issued in the 700s was way in the future for police. So, he choose 7 as the first number and just doubled it for the last numbers – 14. Mark VII Productions, Inc. was Jack Webb’s production company. What is the meaning behind the logo that can be seen at the end of Dragnet episodes (iron door with a hand pounding the Roman numerals with a hammer)? Jack Webb “stole” the idea from Arm & Hammer baking soda. He said he liked the look of it as a kid. The door to him also meant strength. The VII for 7 was probably, again, use of his lucky number. 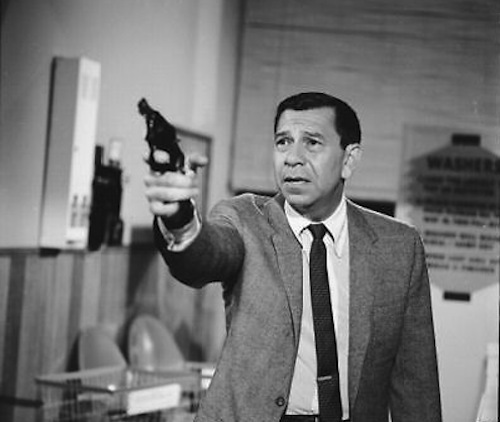 Jack Webb used a real badge and revolver during the first run of Dragnet. What happened to those items after the show ended and what did he use for a badge and revolver in the new Dragnet show? When the show ended in 1958, he returned the official, registered items to the LA Police Department, which had issued them to Webb for the show. He got them back from the Police Department for the new Dragnet show. What Emergency! regular doubled for Jack Webb’s Joe Friday character in long shots on the original Dragnet? Marco Lopez. He also had small parts on Dragnet, as well. He admitted that he liked to cook while on that show and the cast and crew got to partake in his hobby to their delight. This led to the fully-equipped kitchen at the firehouse on Emergency! — he could not only be a regular on the show, but keep on cookin’. Which actor did Jack Webb want as Sgt. Joe Friday in the original series, but reluctantly took the role himself, when it didn’t pan out? Lloyd Nolan, best known for his acting roles portraying private detectives Michael Shayne and Martin Kane. In 1953, a famous movie producer friend and his wife sold their house to Jack Webb, so they could be closer to a park for their son. Who was this producer and what special thing did they do to the house to sell it to him? A deluxe, chartered airplane provided by Warner Brothers for Webb’s cross-country tour promoting Pete Kelly’s Blues (1955). It had an eight-person crew, dining room, bedroom and even a conference room. Speaking of Pete Kelly’s Blues, Herm Saunders played the pianist. What was his relationship to Jack Webb in real life? At the time, he was Webb’s press agent. Jack Webb directing Martin Milner and Kent McCord in the Adam-12 pilot. 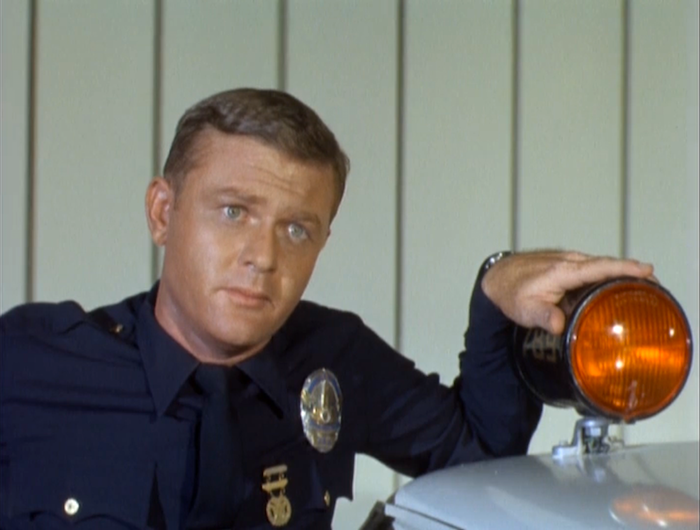 How did Ozzie Nelson (of Ozzie And Harriet fame) come to direct a segment in an episode of Adam-12? Jack Webb turned down the chance to make a movie, which lead to great animosity between the guy who wrote the story for the movie and Kent McCord. Who was the author, what was the movie and why all the hostility? Hopefully, this blogathon has you wanting to see more Jack Webb, or better yet, own it. (I can’t wait to revisit The D.I.) Here’s where you can get the stuff written about over the weekend. Physical evidence, I guess you could say. Public domain episodes are available from various companies. Quality varies from pretty darn good to absolutely wretched. You can also find some on YouTube and Roku. Available from Universal’s Vault program. If I didn’t consider this movie absolutely essential to life as a human, I’d tell you to wait till it was redone, preferably for Blu-ray. You’ll find Dragnet on MeTV and Hulu Plus, along with Adam-12 and Emergency! They’re also on DVD from Shout Factory, complete with some really terrific extras, including the 1966 TV movie. Several DVD sources for this one. Stay away from Alpha, and you’ll be OK. This is available on DVD from Olive Films—and in the same Blu-ray noir set as Appointment With Danger. Olive Films has brought this to DVD as a stand-alone disc and on Blu-ray as part of a film noir set. Warner Brothers brought this out on DVD, and Warner Archive recently announced a Blu-ray. Can’t wait. You can get this one on DVD from Warner Archive (and you should). Again, our friends at Warner Archive can set you up with this one on DVD. Thanks to my wife Jennifer for researching and writing the trivia stuff.